Emilie is in desperate need to escape from it all. She flees her Dutch home, leaving behind her husband, career, her studies and the bitter notes from the young student she had an affair with. She finds herself renting a country cottage in rural Wales, surrounded by British wildlife, with Mount Snowdon on the horizon. To begin with, she manages to keep herself isolated but as she slowly ventures into the surrounding areas, she comes across more and more local residents. Then one day a young man stumbles into her garden and her plan of quietly living alone changes. But as her husband sets about hunting her down, he discovers the secret that could explain her recent change in character. The description on the rear of this book gives across the impression that it is a twisting thriller but it really is far more delicate than that. To begin with, you are unsure if the main character of Emilie is a victim or predator and as the story slowly unfolds, this uncertainty is continually played with. Although not a read for the lovers of action, the slow pacing and in-depth descriptions do leave you truly caring for Emilie, even if you are not sure she deserves it. The ending is a fabulous combination of tension, sadness and regret that makes it intensely moving. The Detour is an incredibly tender book, capturing new and old relationships in simple yet beautiful detail. 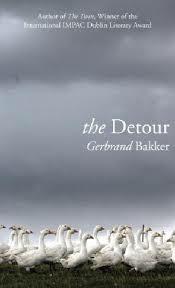 Since reviewing The Detour by Gerbrand Bakker it has gone on to win The Independent Foreign Fiction Prize and be shortlisted for the IMPAC Dublin Prize.